We continue our run of last chapters, this time with Sansa. The Battle of Blackwater has concluded and it is time for the spoils of war to be distributed. These spoils aren’t necessarily so much the physical goods captured (since this was a defensive war for the victors) but more the distribution of political capital for the Tyrells who will soon be making their grand debut on the main stage of the Westerosi side of the ASOIAF conflict. Sansa herself finds herself somewhat on the margins in all this. Joffrey has moved on – though tormenting Sansa will remain a fond hobby of his – and with him followed most of his court. With the grand Tyrells strutting around, Sansa is no longer the hot topic that she once was and this suits her just fine since it gives her time to think about her escape from King’s Landing. Little does she know, she will be given the key to that escape from a less than reliable source by this chapter’s end. 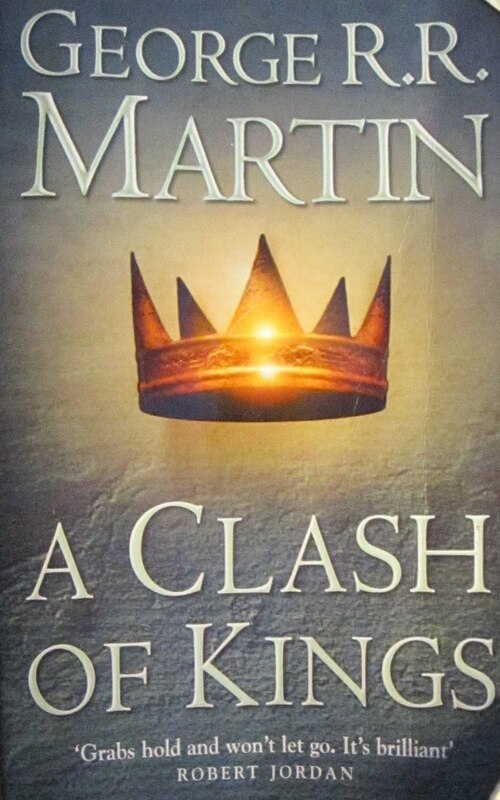 As with the other previous ‘final’ chapters, I will spend some time wrapping things up with Sansa for A Clash of Kings before looking forward to her role in A Storm of Swords. The Lord of Casterly Rock made such an impressive figure that it was a shock when his destrier dropped a load of dung right at the base of the throne. Joffrey had to step gingerly around it as he descended to embrace his grandfather and proclaim him Savior of the City. It seems that Tywin’s horse has precisely as much respect for Joffrey’s authority and position as Tywin himself. Thus far, we’ve only seen Tywin through Tyrion’s eyes, on a single occasion. He cut an impressive figure then as well but Tyrion’s opinion of the great Lord was biased in no small part by the incredibly tense relationship between the two men. Tyrion felt a mixture of fear and resentment towards Tywin but Sansa, untouched by any past dealings see him more as the rest of Westeros does – as this ascendant figure, prim and proper in every way and a man not to be trifled with. Loras’ addition to the Kingsguard makes sense within the story since most people are all too aware of just what kind of a monster Joffrey is but outside the story itself, it seems that Martin saw more promise in young Loras than in either his father or brother. Yet, despite making more frequent appearances, it doesn’t seem like Loras will have much more to contribute to the overall plot than he has at this point. He will serve in the Kingsguard, yes, but it won’t be a particularly long or distinguished career since he will bear terrible injuries in the siege of Storm’s End before allegedly passing away (or was he still on the brink?). It seems that Martin just liked the character enough to want to keep him around with really any purpose for him to play in the larger story. Lord Tywin was looking at his grandson. Joff gave him a sullen glance, shifted his feet, and helped Ser Garlan Tyrell to rise. Was he really that reluctant to give Sansa up? Granted, he hadn’t seen Margaery just yet but I was surprised that he was so unenthusiastic about it. Alright, time for a tinfoil theory: Joffrey actually had feelings for Sansa Stark. Say what?! Yup, you read that right. So, here’s how my theory goes – Joffrey actually really liked Sansa Stark; not as a woman but as a pet. His reluctance here isn’t because he is being made to part ways with a real person he has feelings for but rather because he is losing his best claim to a plaything. Who knows if he would be able to push Margaery around the way he could Sansa? And if Margaery gave in, Loras would bash Joffrey’s brains out if he so much as laid a finger on Margaery. So, as far as Joffrey is concerned, the good times have ended and while it’s still and always will be ‘Make-Sansa-Miserable-Day’, he will have to try harder to make use of them, especially with Tywin watching. In one fell swoop, Joffrey made Littlefinger both one of the most powerful and powerless Lords in Westeros. Powerful because should the Lannisters prevail, Littlefinger would command the Riverlands and Harrenhal – that’s a lot of real estate and with that real estate comes a lot of men and resources as well. Yet, the Riverlands, as we see again and again, is nigh impossible to defend and we should commend Tyrion for suggesting the Riverlands as Littlefinger’s prize. From a military standpoint, Littlefinger would never become a real threat by being Lord of the battered and demolished Riverlands. Of course, Littlefinger isn’t thinking about conquest – not just yet anyway. What the Riverlands and Harrenhal give him is some form of legitimacy that will allow him to make more political power plays and give him access to some of the highest rungs of the Westerosi political ladder. He chopped down with his hand, a furious, angry gesture … and screeched in pain when his arm brushed against one of the sharp metal fangs that surrounded him. The bright crimson samite of his sleeve turned a darker shade of red as his blood soaked through it. “Mother!” he wailed. Did Joffrey just cut himself and then scream for his mommy? Just when you thought he couldn’t fall any lower…Of course, Joffrey’s cut becomes a big deal and the healers are summoned, yadda yadda. Of more import, however, is that Joffrey cut himself at all – to the superstitious Westerosi, it is a bad omen, especially on a day like this. What I myself found notable however, was how smoothly Tywin stepped into his place and instead of a big fuss being kicked up, the ceremony moved forward as usual. It’s a sign that Tywin is the real power in King’s Landing, though anyone with eyes already knew that. “The night of Joffrey’s wedding. After the feast. All the necessary arrangements have been made. I had totally forgotten that Sansa knew this all along! I am double surprised that this plan had been in motion from so early on. My recollection was that Sansa had no idea that she would be leaving until Dontos actually snatched her and put her in the boat. Certainly, I don’t remember her chapters in A Storm of Swords showcasing any sort of anticipation – you would think that if there was even the slightest possibility that she could escape on Joffrey’s wedding night, it would feature more prominently in her thoughts. Yet, with all the gossip and politicking surrounding her, Tyrion, Shae and Loras, perhaps everyone, Sansa included, forgot that her great escape plot was in motion. Either way, it’s nice to see it foreshadowed so early on. That brings us to an end of Sansa’s portion of A Clash of Kings. In some ways, I feel Sansa’s role in the story became slightly less relevant once we got a second, more involved POV in King’s Landing in the form of Tyrion’s character. Hmmm… it might be because I like Sansa so much, but I think her POV in King’s Landing is of equal relevance (albeit in a different way) to Tyrion’s. I mean, Tyrion’s a cynic despite being decent at times, so he’s certainly not going to divulge into the discourse of knightly and courtly manners that Sansa divulges into, the farce that knighthood and court life is based on. Tyrion is protected from that constant threat on his life by writ of Tywin’s shadow presence and his monopoly of violence (The goldcloaks and his clanspeople). With no immediate authority and no support base, Sansa could legitimately end up dead, given one of Joffrey’s mercurial rages, and no knights will protect her because, despite fantasy glamorizing knights, they’re all trained swords and not necessarily expected to adhere that tightly to knightly conduct, especially if they’re going up against a mad (boy) king. Tyrion’s the cynical fantasy politician who divulges into intrigue (admittedly with far more flaws and vulnerable nature from a sexual (Shae) and physical (his dwarfism) standpoint). He’s not perfect, as you point out, we just read from his tight point-of-view. Sansa’s the idealistic humane survivor perspective to Tyrion’s real-politicking. If Tyrion’s plotline is a fantasy intrigue played straight, Sansa’s a deconstruction of this fantasy intrigue by showing how ugly court life and knighthood can be to someone with as little power as herself. We can’t all be Tyrion. And Loras… perhaps? I think Martin seeded him here because the Purple Wedding wouldn’t make as much sense (one of the chief reasons was that Loras would become a new Kingslayer), though, yeah, it would make sense even without it. Joffrey is that horrible a human being to consider poisoning even without Loras’ position to note. I’d have more to say, but I’ll save that for when we reach more Loras chapters, but his story is really sad in terms of exploring love in ASoIaF. That Joffrey theory I half-agree. Sansa is an easy target to him and always was, considering Robb was miles away. Plus, he’s already burnt that bridge with the North, so unless the northern army comes to chop his head off personally, there’s no repercussions to beating Sansa from then on out. Though, I think it might overrate Joffrey’s intelligence to think that far ahead in the Margarey-Loras repercussion. This is the brat who mouthed off to TYWIN when he was sufficiently upset. I think he was just sulky because his favorite toy was taken from him. And… something that amuses me and chokes me up is the sheer loyalty that those Stannis loyalists here show towards his king. The one no one loved. I mean, the ‘likeable’ one, Renly, most of his Stormlands bannermen switched immediately to Stannis after his death and the Reachmen… they had little reason to stay loyal once the Tyrells withdrew their support from Renly’s base. Here? These bannermen could have easily asked pardon or clemency. Tywin was open to it. No, they spent it on being defiant for their king. Yeah, some of it could be R’hllor influence, but it seems like Stannis seems to inspire a certain… not love, but loyalty in his bannermen. There’s so much of Sansa’s A Storm of Swords plotline seeded here that it’s a bit hard not to come out of rereading A Clash of Kings with an idea of how much future plot threads are foreshadowed early on. You know, about your point about Stannis – I wouldn’t read all that much into it. For every one of the soldiers like that, there were a good number of Lords and Lordlings that jumped ship (literally!). Apart from that, I agree with all your points above, especially how Tyrion’s and Sansa’s POVs show two different sides of the same thing. True, some of it can be just exceptional loyalists and some followers of R’hllorism, it’s more the fact that Stannis is so vilified for having a grim, stern attitude (which I always felt was a bit exaggerated and then later exacerbated by the War of Five Kings) that it’s nice to see people take a stand for him. It’s also kind of funny, considering they’re taking a stand for frickin’ killjoy-sad puppy Stannis Baratheon.